If you want sketch a drawing using a semi-transparent colour to get a paper-like feel, then use the Brush tool as it produces a more realistic and natural feel. In the Thumbnails or Timeline view, select the panel on which you want to draw. 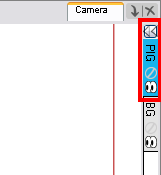 In the Thumbnails or Stage view, select a layer to draw on. You can change the current colour by adjusting the sliders in the Colour view, or click a swatch to use that colour. To add colour swatches—see Adding a Colour Swatch. ‣ Hold [Ctrl] (Windows) or [z] (Mac OS X) to force a line to join the start and end of the stroke while drawing. 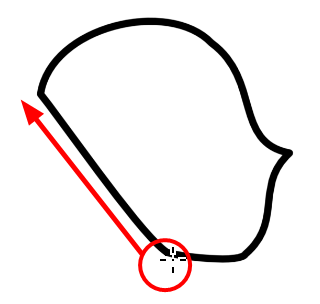 ‣ Hold [Shift] to force the brush to draw a straight line at any angle. ‣ Hold [Shift]+[Alt]to force the brush to draw a straight line in 15 degree increments. ‣ Press ](close bracket) to increase the brush tip size by 5. ‣ Press [(open bracket) to decrease the brush tip size by 5. ‣ Hold the [O] key, click and drag to resize your brush dynamically, then release the mouse when the desired maximum thickness is reached. 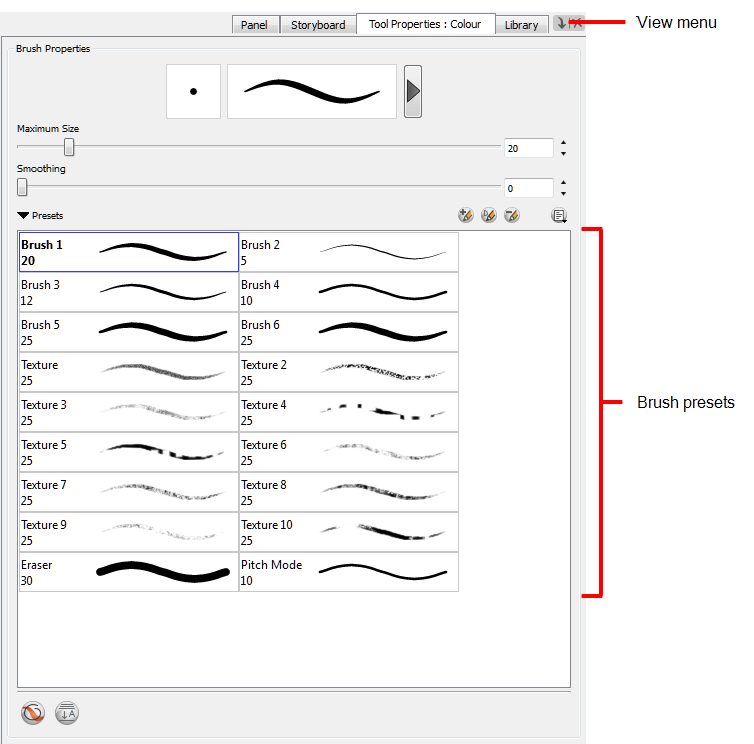 When you select the Brush tool, the Tool Properties view displays the different Brush modes that control how the Brush line is drawn: Regular, Draw Behind, and Auto Flatten. When drawing on vector layers, the Draw Behind mode lets you paint behind existing art. By default, strokes appear over your work until you release the tool. If you want a live preview of your stroke in draw behind mode, you must activate the Realistic Preview option. ‣ From the top menu, select View > Realistic Preview. ‣ In the Tool Properties view, click the Brush menu, and select Small Thumbnail, Large Thumbnail, or Stroke View. When creating drawings for a panel, there may be a specific object that is repeated many times to create a bigger picture, such as a landscape. 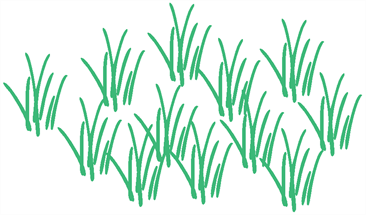 The object can be a blade of grass, tree, or rock. Instead of creating this drawing and then copy/pasting it over and over again, you can create a pattern and assign it as its own brush. 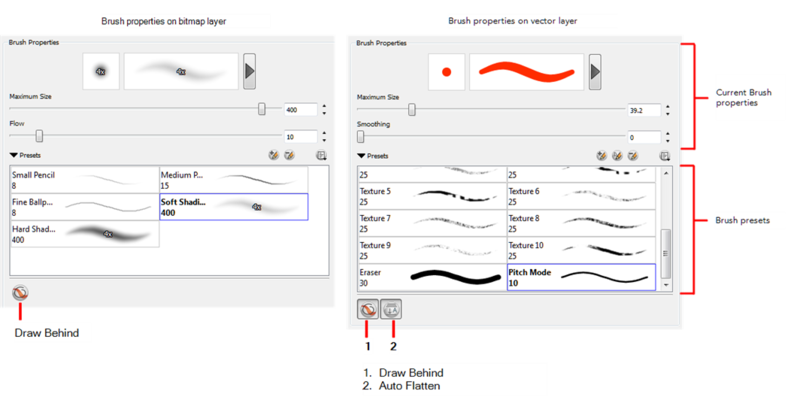 You can create your pattern, select it, and add it to your brush styles using the Dynamic brush. 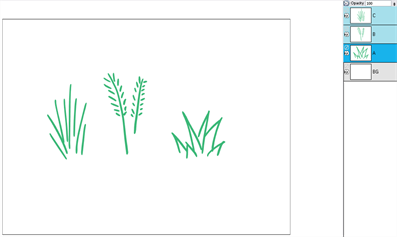 Use the Brush drawing tool to create a small drawing. NOTE: If you are drawing on a vector layer, you may want to select Auto Flatten mode to help create a single object. Use the Select tool to choose the parts of the drawing you want to use as the pattern. 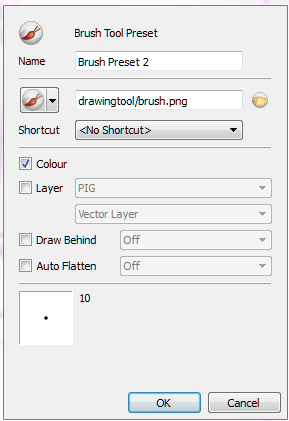 In the Tool Properties view, click the New Dynamic Brush button to use the current layer as a new brush pattern. If you do not want to use the entire layer as the brush pattern, select the parts of the drawing you want to use as the pattern. 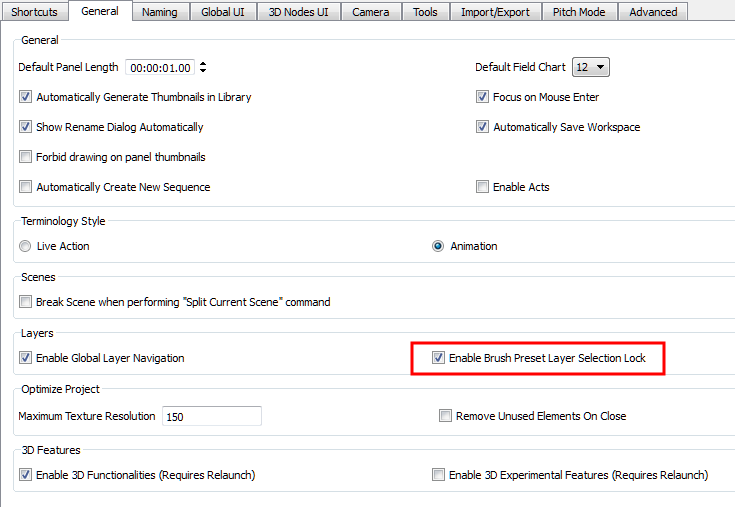 If you do this, you must reselect the Brush tool before you click the New Dynamic Brush button. 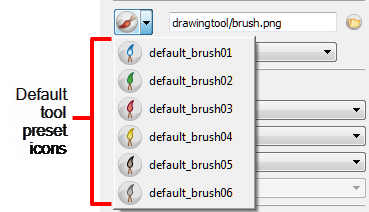 When you add the Dynamic Brush to your brush styles list, it is given a default name and a preview appears in the Tool Properties view. You can use the Rename Brush button to give the Dynamic Brush a more meaningful name. Use the new Dynamic Brush to quickly repeat a pattern. Create drawings on the same layer of multiple panels or multiple layers of the same panel. In the Thumbnails, Timeline, or Stage view, [Shift]+click to multiselect all the layers you want to use to create the Dynamic brush. If you are creating your brush with panels, [Ctrl]+[Shift]+click (Windows) or [⌘]+[Shift]+click (Mac OS X)) the panels to use to create the Dynamic brush. Select the Brush tool and click the Add Dynamic Brush button. 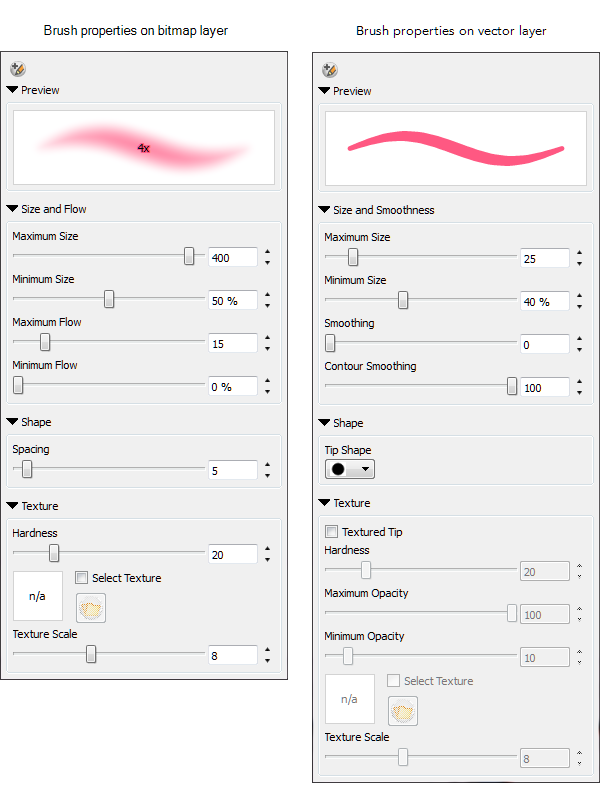 In the Tool Properties view, adjust the slider to see the properties of the Dynamic brush. Your new Dynamic brush will contain all the selected drawings. When you use this brush, you will cycle through the drawings. 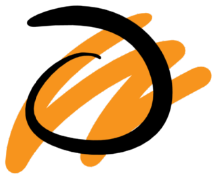 The brush properties available depend on whether you are drawing on a vector or bitmap layer. On both layers, you can set the minimum and maximum sizes of your tool, which produces the thick and thin effect on your line. This works with the pressure sensitivity of a pen tablet. On vector layers, you can modify the central line smoothness of your line, as well as smooth the initial movement of your line. Increasing the value will result in a smoother line with fewer control points. On bitmap layers, you can optimize the flow of lines and set the rate at which colour is applied as you draw. As you draw over an area, the amount of colour builds up based on the flow rate, up to the maximum flow rate you set. The Properties window of the Brush tool opens. ‣ Maximum/Minimum Flow: Sets the rate at which colour is applied as you draw a stroke. As you draw over an area, the amount of colour builds up based on the flow rate, up to the maximum flow rate you set. ‣ Spacing: Controls the spacing between the brush marks of a stroke. ‣ Hardness: Controls the size of the brush's hard centre. ‣ Select Texture: Uses a pattern to make strokes—see Drawing with Textured Brushes. ‣ Texture Scale: Determines the size of the texture used in strokes. ‣ Shape: Lets you select a shape for the tip of the brush. There are a variety of brush tips to choose from: round, square, oval, star-shaped, and more. ‣ Textured Tip: Uses a pattern to make strokes. ‣ Opacity: Sets the minimum and maximum transparency of strokes. In Storyboard Pro, you can draw with a textured line. 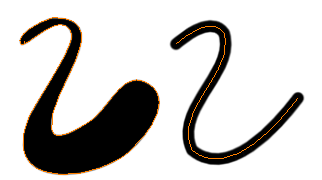 When drawing on vector layers, textured lines are a mixed bitmap image contained in a vector frame. This allows you to sketch as if you are drawing on paper. When drawing on bitmap layers, there is no vector frame. There is only one big rectangular canvas that you are drawing on—see Drawing with Textured Brushes. When drawing on vector layers, you may want to change brush strokes to pencil lines to convert contour strokes into centre line pencil strokes. Select the strokes you want to convert. 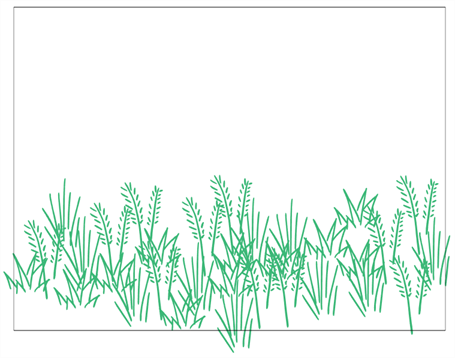 Right-click and select Convert > Brush Strokes to Pencil Lines. Brush presets are created by saving the properties of the current brush to a new preset, which you can reuse for repeated tasks. You can create as many brush presets as you need. • From the Panel view, click the View menu and select Tool Properties. ‣ Click the New Brush button—see Viewing Tool Properties. The Tool Presets toolbar lets you create new tool presets and manage them. There are four default brush presets to get you started—Rough, Clean, Shading, and Revision. By default, this toolbar is not displayed. 1. 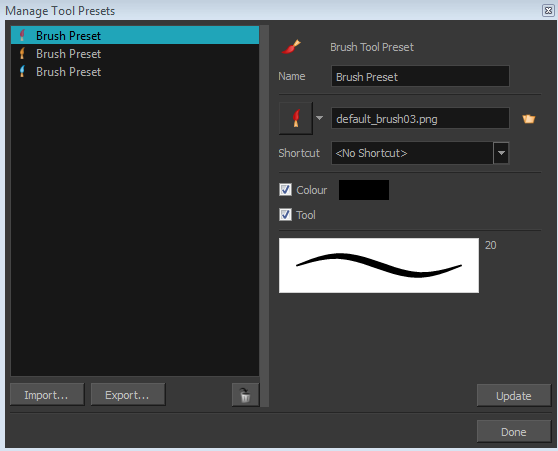 In the Panel view, use the Tool Properties view and/or the Brush Properties window to customize the tool. 2. From the icon list, select an icon to quickly identify your preset or upload your own by clicking the File button. (Optional) From the Shortcut menu, set a keyboard shortcut to quickly access your preset. By default, the shortcuts are unassigned. To assign a keyboard shortcut, go to the top menu and select Edit > Preferences > Shortcuts > Tool Presets (Windows) or Storyboard Pro > Preferences >Shortcuts > Tool Presets (Mac OS X). ‣ If the layer already exists, then that layer is selected, and you will continue to draw on that layer. If the layer does not exist, then clicking on the preset will create that layer for you. ‣ Draw Behind: When this option is selected, saves the specified Draw Behind option to the tool preset. When deselected, the current Draw Behind status is unchanged when the tool preset is clicked—see Changing the Brush Mode. ‣ Auto Flatten: When this option is selected, saves the specified Auto-Flatten state to the tool preset. When deselected, the current Auto-Flatten state is unchanged when the tool preset is clicked—see Changing the Brush Mode. 4. In the Import Brush Presets window that opens, locate and select the preset(s) to import and click Open. In the Export Brush Presets window that opens, select the preset(s) to export and click Export. 6. Give the exported preset(s) a name and click Save. Adjust the current settings for the tool preset you want to update. 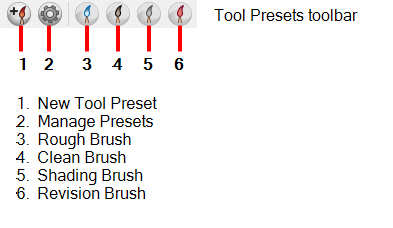 In the Manage Tool Presets dialog box that opens, select the tool preset from the Brush list on the left side of the dialog box. In the Import Brush Presets window that opens, select the preset(s) to update and click Open. 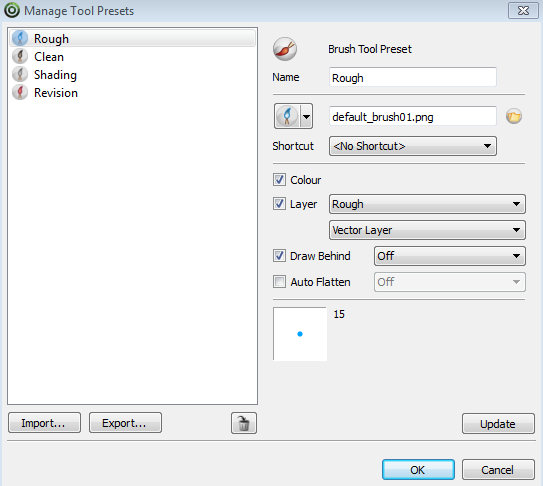 The current brush properties are applied to the brush preset you updated, as well as any changes to the settings in the Manage Tool Presets dialog box. Assigning a keyboard shortcut to tool presets lets you quickly access them—see Customizing a Keyboard Shortcut. When using presets, it is possible to assign a layer so a tool specifically draws on that layer. When the preset is selected, it will verify if the layer exists. If so, the layer will be selected and if not, it will be created. 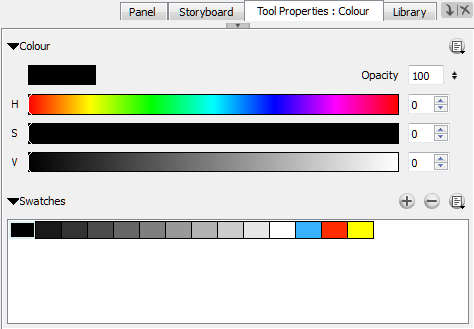 When changing panel, depending on your global navigation setting, the normal behaviour is that Storyboard Pro name will look for the same layer and if it does not exists, it will select the first layer available. To prevent Storyboard Pro to select a random layer and not have it select any layer, you can enable the Enable Brush Preset Layer Selection Lock preference. This way, you will avoid to draw your artwork on the wrong layer and your project will remain even cleaner and organized. ‣ Windows: Select Edit > Preferences or press [Ctrl] + [U]. ‣ Mac OS X: Select Storyboard Pro > Preferences or press[⌘] + [,].